The United States Federal Housing Administration (“FHA”) has been a versatile tool of government since it was created during the Great Depression. It achieved success with some of its goals and had a terrible record with others. Its impact on African-American households falls, in many ways, into the latter category. The FHA began redlining African-American communities at its very beginning. Its later days have been marred by high default and foreclosure rates in those same communities. At the same time, the FHA’s overall impact on the housing market has been immense. Over its lifetime, it has insured more than 40 million mortgages, helping to make home ownership available to a broad swath of American households. And indeed, the FHA mortgage was central to America’s transformation from a nation of renters to homeowners. The early FHA really created the modern American housing finance system, as well as the look and feel of postwar suburban communities. Recently, the FHA has come under attack for the poor execution of some of its policies to expand homeownership, particularly minority homeownership. Leading commentators have called for the federal government to stop employing the FHA to do anything other than provide liquidity to the low end of the mortgage market. These critics’ arguments rely on a couple of examples of programs that were clearly failures, but they fail to address the FHA’s long history of undertaking comparable initiatives. This Article takes the long view and demonstrates that the FHA has a history of successfully undertaking new homeownership programs. 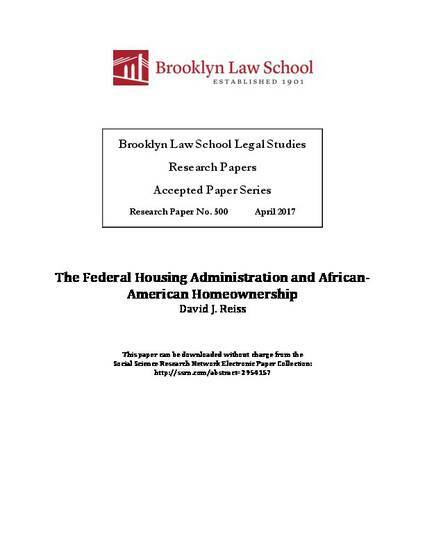 At the same time, the Article identifies flaws in the FHA model that should be addressed in order to prevent them from occurring if the FHA were to undertake similar initiatives to expand homeownership opportunities in the future, particularly for African-American households.